Deleted TIFF/TIF photos after emptying computer Recycle Bin or Trash. Formatted memory card or disk drive which contains a batch of TIFF/TIF files. Storage media (hard drive, memory card, USB drive etc.) corrupted, causing those TIFF/TIF images inaccessible. TIFF/TIF photos shown as RAW or split into two parts, shift in photo content etc. Other TIFF/TIF loss or damage situations. TIFF (Tagged Image File Format) is a flexible format that normally saves 8 bits or 16 bits per color (red, green, blue) for 24-bit and 48-bit totals, respectively, usually using either the TIFF or TIF filename extension. TIFF’s flexibility can be both an advantage and disadvantage, since a reader that reads every type of TIFF file does not exist. TIFFs can be lossy and lossless; some offer relatively good lossless compression for bi-level (black&white) images. Some digital cameras can save in TIFF format, using the LZW compression algorithm for lossless storage. However, chances are there when you accidentally removed TIFF/TIF files off your computer (by emptying Windows Recycle Bin or Mac Trash), hard disk, digital camera/camcorder, camera media card, cell phone, USB, memory card, memory stick, external ZIP/USB drive, removable smart media, SD cards, etc. Or the TIFF/TIF photos become badly damaged or corrupted and look blurring. Is there any way to recover deleted or corrupt TIFF/TIF files? In order to deleted, formatted, lost and even corrupted TIFF/TIF images, you need to get a TIFF/TIF recovery software at first. 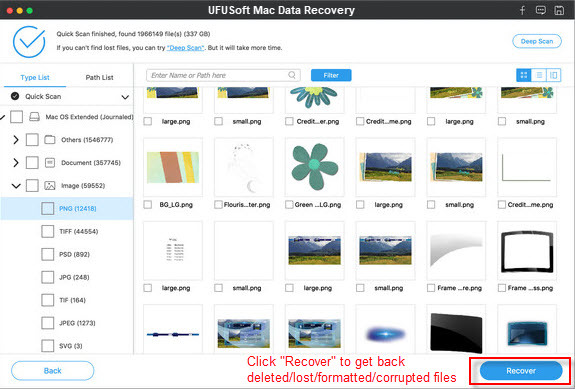 If you don’t have one, you can have my recommendation here: TIFF/TIF recovery software from UFUSoft (compatible with Windows 10/8.1/8/7/Vista/XP), or TIFF/TIF repair software for Mac (compatible with Mac OS X 10.12, 10.11, 10.10, 10.9, 10.8 (Mountain Lion), 10.7, 10.6, or 10.5). 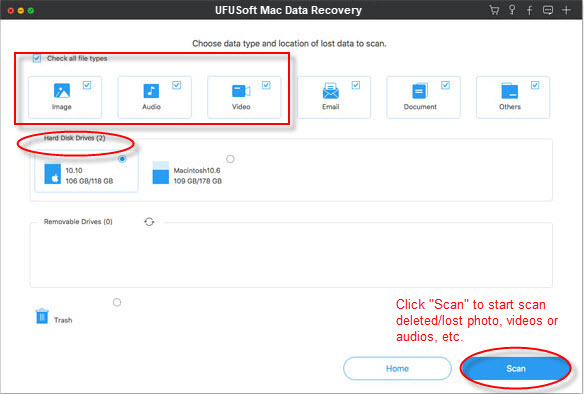 Both of the TIFF/TIF Recovery Software enable you to recover deleted/corrupted/formatted/lost TIFF/TIF photos from computer, memory card, external hard drive or other storage devices in 3 steps. Step 1 Connect your SD card with your computer and launch UFUSoft Photo Recovery for TIFF/TIF program. You will see an interface displays devices supported by this program. Click “Start” to continue. Step 2 Here the local partitions and external storage devices on your computer will all be scanned and listed by TIFF/TIF Files Recovery. You just need to select the one for your SD card and click “Scan” to detect files in your SD card. Note: You can click “Filter Options” to refine the scan result in “tiff/tif” format. Step 3 All found files in your SD card will be displayed after the scan. You can preview the found TIFF/TIF files so as to check whether they are what you want to restore or not. Then you just need to select TIFF/TIF files you need and click “Recover” to save them to local folder in your computer. Note: Please do not save the restored TIFF/TIF images back to your SD card after the recovery.